Along the way, Henry met Les Glover (AKA Loved Up Les), a talented chap with a long and impressive CV. Henry and Les began gigging together and have done so for quite a few years now. 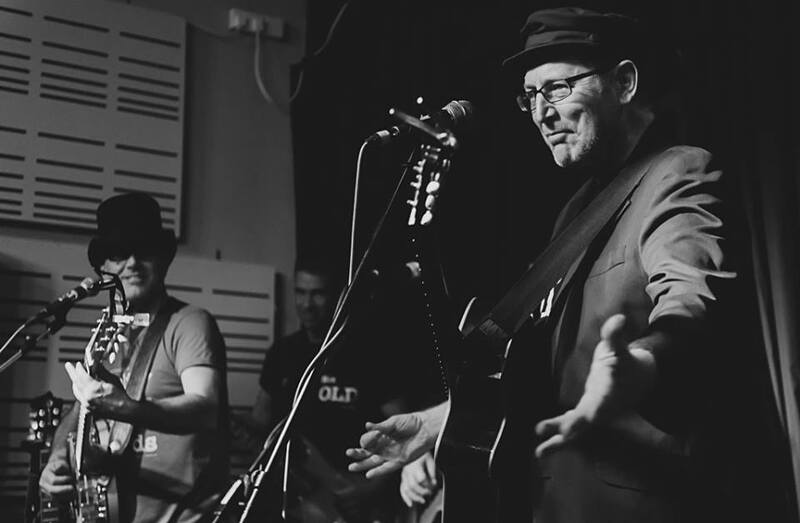 Though not as high-profile as Mr. Priestman, Les has worked with or shared the stage with Graham Gouldman (10cc), Gary Barlow, Deaf School, Pete Riley, JJ Gilmour, Ian McNabb, Wreckless Eric and many others. He also released his critically-acclaimed solo album THE LOVE TERRORIST, which reflects his growth as a singer, songwriter and performer over the years… and makes him the perfect musical foil/collaborator for Henry Priestman. Like Henry, Les writes songs that connect with the listener on an emotional level. And unlike most singer/songwriter types with a penchant for acoustic guitars, he never takes himself too seriously. Taking all this into account, it is quite obvious why Henry and Les have combined their talents on 2017’s SIX OF ONE & HALF A DOZEN OF THE OTHER. While they’ve helped out on each other’s projects in the past, this is their first true collaborative album. And it is, as they say, a corker! As the title suggests, SIX OF ONE & HALF A DOZEN OF THE OTHER features both artists contributing six songs each to the project. 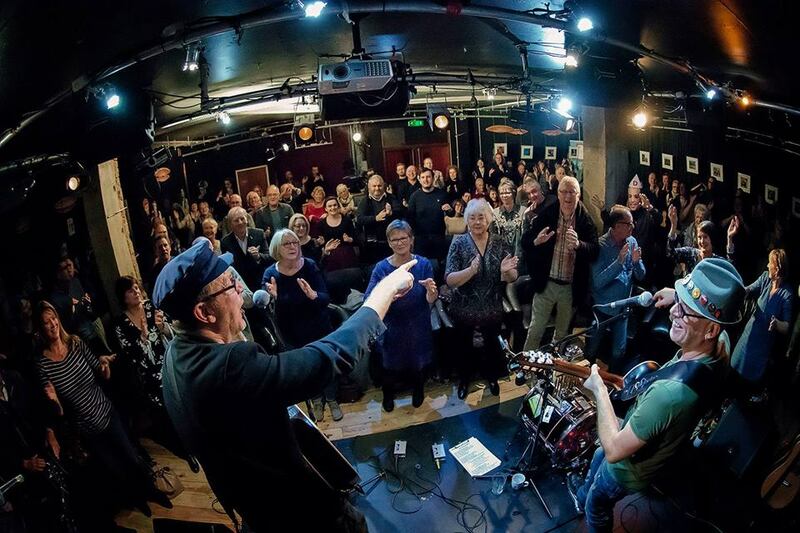 Aided by some extremely talented friends, the album blends British and American Folk with classic Pop songwriting and a refreshingly honest outlook on life from two ‘men of a certain age’ who have embraced where they are in life… and they invite everyone else to enjoy the party with them. Highlights of the album include the ‘singles’ “Not In My Name” and “Gamble With Love” as well as “Sing It Like You Mean It,” “Her Ladyship” and “The Ghosts Of A Thousand Fishermen”. As an extra bonus, they tackle the classic Yachts single, “Love You Love You,” and give it a makeover. Again, neither Les nor Henry are interested in revisiting their youth but that doesn’t mean they can’t revel in it every now and then! Back to front, the album is a real treat that has more depth, more honesty and more hooks than you can count. Currently available online (see below), the duo is hoping for a wider release of the album on vinyl and digital formats in the new year. Stephen SPAZ Schnee was able to send off questions to Henry and Les, which they were kind enough to respond to… shortly before filing a restraining order against Mr. Schnee! LES GLOVER: Hi, I’m Les, singer/songwriter and guitar player from just outside Liverpool. Playing and singing for 40 years and still loving it. 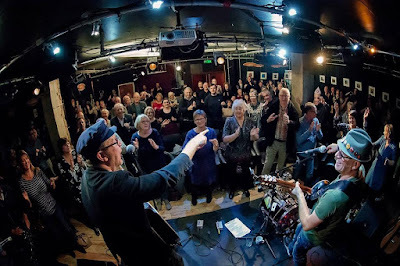 HENRY PREISTMAN: I’m Henry, from Hull on the North-East coast of England, but moved to Liverpool in 1975...been in music since 1977 (Yachts, It’s Immaterial, The Christians, plus songwriting and production), and then in 2008, aged 53, I started on a solo career, having not sung since 1981! Now having the best time of my life. 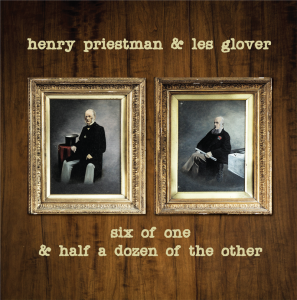 LES: The new album SIX OF ONE & HALF A DOZEN OF THE OTHER Is a joint album by myself and Henry Priestman with six songs allocated to each. Henry and me have a similar writing style and so the songs seem to gel together well. They are all very melodic and very lyric driven with equal measures of poignancy, anger and frustration, hopefully delivered in a joyous way. HENRY: Hey, it’s quite good going after Les in this interview, I can just go “see above!” Mr. Glover hit the nail on the head. SPAZ: Which song off the album do you feel best defines the essence of the album and/or what this duo project is all about, musically? LES: Hard to say I think ‘Ghosts of a Thousand Fishermen’ and ‘Tony’, though radically different, both have a strong story to tell and set a scene for the listener to hang onto. HENRY: Actually, I don’t think there really IS a particular “essence”, or one song that epitomizes the album. But amazingly, it all appears to hold together well…as Les mentioned, our writing styles aren’t a million miles apart, and we both share similar eclectic tastes in music; so on this album you will find influences on different tracks of folk, storytelling, Country, ribald Pop, angry rants about the state of the nation/world, poignant singer/songwriter, even our feeble attempts at Bacharach/Latin.…somehow it all works. LES: A bit of both really, although songs are written individually and often with other people, they then become part of a bigger soundscape and part of a collection captured together as a body of work, as most albums are I think. HENRY: I suppose this is slightly different to our other solo albums in that it is somewhat of a “project”, i.e. the idea (suggested by Les) that we do a joint album, with 6 songs each...initially I wasn’t totally convinced, but it didn’t take me long to realise it was a great idea (especially when I heard the calibre of Les’ new songs) that would take the pressure off me having to produce another 12 songs of my own, and also mean I could look to my back catalogue and include a couple of songs that that we do in the live set, but I’ve never recorded solo before. That said, I still believe in the concept of “The Album” (of around 12 songs, and around 40+ minutes long) as a fabulous art form...I subscribe to Bob Lefsetz’s daily music blogs, and he’s always going on about how us “oldsters” need to forget about “the album”, how it’s an outdated idea (which younger artists more and more are turning their backs on) and, what with YouTube/Soundcloud etc., the idea should be about releasing songs all the time (don’t wait to have an album’s worth ready)... Well, I agree with a lot of what Bob says, but we part company here. I still like The Album, and I still buy The Album. Perhaps, in fairness, it’s because we (both Les and I) have a demographic and fan-base (albeit tiny!) of “a certain age” that still buys CDs...so for now, for us, it works! LES: I think either way can work but there’s no harm in using both strategies and bringing them all together at the end. I think you need a fairly good idea of what you want a song to sound like but it’s wise not to restrict yourself by being too possessive. HENRY: Whilst I’d love to return to the old way of recording (i.e. four people in a room, laying down the song almost live), the great thing about making albums the way many of us do nowadays (i.e. at home, in your own little studio), is it means you can make many mistakes, and go up many blind alleys, without spending enormous amounts on studio time (plus session musicians) before you settle on the right feel, the right tempo, the right key, even the right lyric. On this album, I can think of quite a few tracks (amongst them “Tony”, “Ghosts…”, “Old Man of the Sea”, “A Place They Called Forgotten Town”) where we started off with versions that we realized (luckily quite soon in the recording process) weren’t quite right. Yes, it’s a pain when you have to start again, but it’s always worth it in the end, and it’s a bonus that home recording affords you. This process was also helped by the fact that we were able to take our time and ‘road test’ many of the songs before we recorded them, which is a luxury not always accorded to artists these days. LES: Henry and I have very similar tastes but from quite different angles, I’m basically a rocker and Henry is a hippie (ha ha) and on this album, he has brought the softer side out of me and I his rockier side. Actually, scrap that answer - we are virtually the same person who share a creative brain. HENRY: Yes, I agree with Les, we are almost all the time on the same wavelength musically (we love many/all different types of music, especially “Pop” i.e. classic Pop, not what passes for Pop these days). No, there was not one occasion I can think of on this album where either one of us really disagreed with the other (no egos were involved in the making of this album)… even ridiculous ideas like “What if we put a cockerel on that song” met with approval! LES: No, I’m happy to move on to my next bunch of songs and that’s how it should be for any songwriter - don’t let yourself get bogged down with the detail, go with the flow and let it sink or swim. HENRY: I suppose I could be accused of being a “tinkerer”... ask Les. We were hoping to get this album out in December, 2016!! That said, I’m glad we took our time on this album, and got it right; I’m very happy with it, but as Les says above, I’m looking forward to working on new songs, and thinking about my next album. LES: My main influence on this album has got to be Henry. He is the one who has toiled along and shaped my songs and his knowledge of arranging is masterful but from an outside point of view, I think we tried to make this record much more organic than previous ones, taking on folk and old country styles to mix with our pop influences. But because of our limitations they come out as something different, a hybrid if you like. HENRY: Sorry, I’m still fillin’ up having read Les’ answer above!! :-) I think it’s an amalgam of ALL the music that we’ve both absorbed over the last 50 or so years. And we have to give a shout out to all the wonderful musicians/friends who helped us on this album (and made it sound good! ), they all definitely influenced the sound too. LES: The love of my family and friends is a constant and the struggles of my disabled son and how he copes with the world is often both heartbreaking and inspiring. HENRY: Don’t feel I can add anything to Les’ answer, beautifully put. LES: During the recording of one of my songs ‘Old Man of the Sea’, Henry decided to have a cockerel crowing in the middle, just for a laugh and from then on, I knew it was going to be fabulous. The cockerel is still there by the way and still makes me smile, we tried it without for a spell but missed it too much and so we brought him home to roost. HENRY: Ah, the cockerel. The turning point of the album…well, you didn’t expect us to be serious the whole interview, did you, Stephen? Joking apart, I really think it is something a bit special (far better than I thought it’d turn out) ...and unlike my other albums, I’ve not gone through the “oh, is it really all a load of rubbish?” period, that normally happens when you first hear the completed CD. SPAZ: What is next for the two of you? LES: Lots of gigs, promoting the album as much as we can and enjoying the experience. HENRY: Not forgetting videos (which we’ve realized are often people’s first port of call when checking out an artist) …We have two videos out already on YouTube, and another one going up in the next week or so. “The Ghosts of a Thousand Fishermen”, about the death of Hull’s fishing trade, co-written by Mark Herman, with whom I wrote The Christians’ hit “Ideal World” 31 years ago. Then, of course, Les and I will have our own respective solo albums to do (Les has 20 songs already stockpiled for his next album, and I’ve got much of mine sorted too), then it’ll probably be time to do another duo album, so perhaps expect “Six of One and Half a Dozen of the Other, Vol 2” sometime around 2022! LES: My CD player has THE SENSATIONAL ALEX HARVEY BAND LIVE in it and my turntable has The Jags’ NO TIE LIKE A PRESENT and I’m eagerly awaiting Deaf School’s new vinyl offering of LET’S DO THIS AGAIN NEXT WEEK. :-D …and thank you for your time, Mr. Schnee. Henry & Les are just the best. 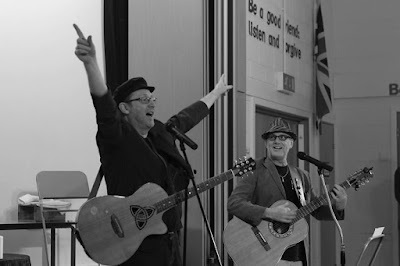 They performed for my 50th last year and earned me more kudos among family and friends than I really deserve.